The Colorado Department of Education (CDE) and the American Association of School Libraries (AASL) have both established standards to guide educators in fostering their students’ development of 21st-century skills. In order to demonstrate the critical role of school librarians in this process, it is important to establish the extent to which they are engaging in activities to meet these standards. 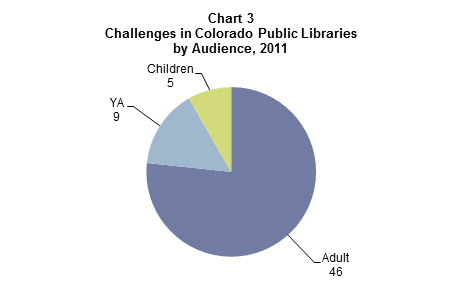 In 2011-2012, 442 school librarians2 participated in the annual Colorado School Library Survey. The survey included a new section that focused on 21st-century instruction strategies. Respondents were asked how often they engaged in the eight strategies listed below, which reflect the CDE and AASL standards. 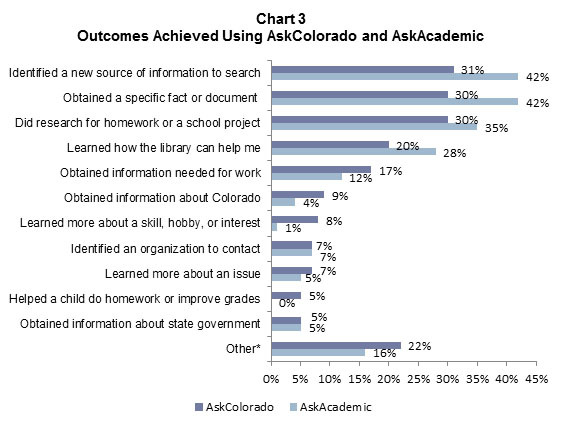 The most frequent activity across Colorado public school libraries with endorsed librarians, regardless of grade level or enrollment, was “teach students to use digital resources”; 7 in 10 respondents reported helping students develop this skill at least once a week. About 3 in 5 respondents reported that they help students apply critical thinking skills (61%) and use technology to organize and share information (59%) at least once a week. Respondents engaged least frequently in the activities “plan instructional units with teachers” and “facilitate learning activities where students work collaboratively in groups;” however, close to half of them reported doing these at least weekly. Chart 1 further breaks down how often school librarians engaged in the eight teaching strategies during the 2011-2012 school year. The three most and least common teaching methods remained more or less consistent regardless of grade level and enrollment, but some differences in the overall levels of library instruction emerged among different types of schools. 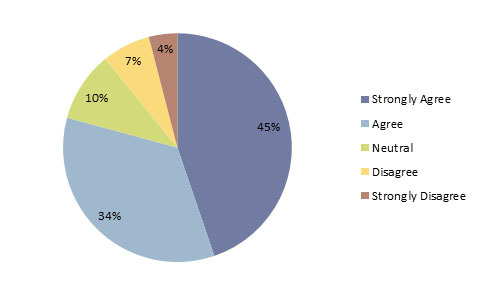 Endorsed librarians at the secondary level, for example, engaged most often in these activities, with as many as four-fifths (82%) of respondents from high school libraries and nearly three-fourths (72%) of respondents from middle school libraries participating in some type of them at least once a week. Elementary schools and combined schools (schools containing grades within both primary and secondary levels, e.g., K-8 schools) reported conducting library instruction less often than secondary schools. Two-thirds of respondents (67%) from elementary schools and a little more than 3 in 5 respondents (63%) from combined schools reported that they engaged in some type of these activities at least once a week. 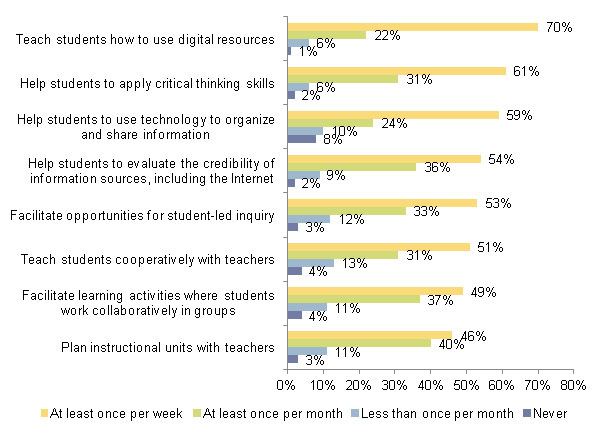 High school librarians were especially focused on helping students to use digital resources (4 in 5 engaged in this activity at least once a week) and to evaluate the credibility of information sources (3 in 4 taught these skills at least once a week). The frequency with which endorsed school librarians engaged in these activities also differed based on enrollment. Librarians at large schools (1,000 students or more) engaged in these strategies most frequently. More than 4 in 5 respondents (82%) from these schools engage in one or more of these teaching activities at least once a week, while this number drops to 3 in 5 (60%) in medium-sized schools (500-999 students), and to a little under half (47%) in schools with fewer than 500 students. Overall, according to these survey results, endorsed school librarians in Colorado are engaging in a variety of teaching activities that help students to acquire 21st-century skills. They are most frequently engaging in activities such as teaching students about using digital resources and critical thinking, but are collaborating with teachers less often. Students in large schools and at the secondary level have the greatest advantages in library instruction. In contrast, elementary school students and students in combined and/or small schools are less likely to encounter 21st-century instruction strategies in their school libraries. When considering these results, it is important to keep in mind the challenges that schools face in the current economy with regards to funding for resources and staffing, and how they limit the extent to which school libraries can implement 21st-century instruction strategies. Small schools may be particularly vulnerable to such challenges. Therefore, stakeholders should carefully consider how access to funding and other resources impact school libraries and student academic achievement. Looking forward, these results may be used to direct the professional development activities of school librarians to better align their skills with current educational standards. In addition, as these instruction strategies become more fully implemented, the survey results may help to demonstrate the central role of school librarians in imparting 21st-century skills to students. One of the key activities of the CSL BTOP grant is for PCCs to offer computer training classes to the public. Class topics include basic internet and computer use (email, internet searching, social networking), office skills (Microsoft Office, presentations), job seeking (resume basics, job search strategies), multimedia (photo editing, website design), and mobile computing (e-books, mobile devices). A total of 57 PCCs offered 1,364 classes to 8,625 participants between March and December 2011. Of these PCCs, 26 (46%) administered a survey in their classes to receive feedback from participants. 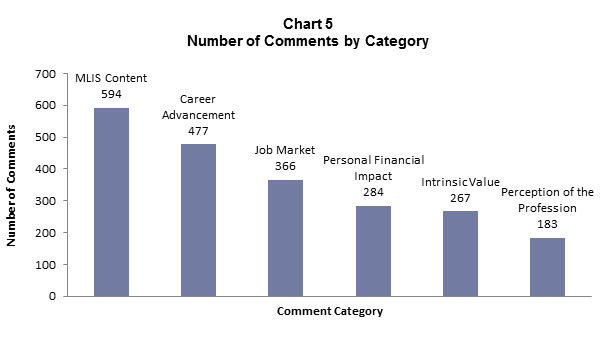 Between May and December 2011, 31,755 participants completed the survey, which contained questions about the class, as well as about participants’ previous experience with computers. More than 9 in 10 respondents agreed or strongly agreed that the instructor presented the information clearly, that they learned a valuable skill in the class, and that they would be able to use what they learned (see Chart 1).5Overall, respondents expressed satisfaction with the classes, with more than 95% strongly agreeing or agreeing that they would recommend the class to someone else. 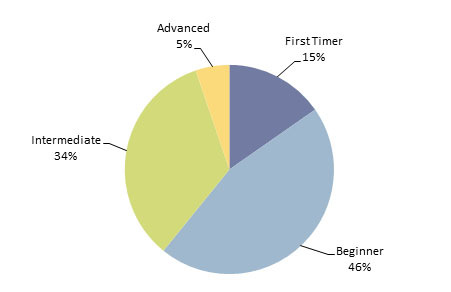 Prior to the class, close to two-thirds (61%) of the participants determined their level of computer experience to be either first timer or beginner (see Chart 3). The remaining 39% identified their level as either intermediate or advanced. 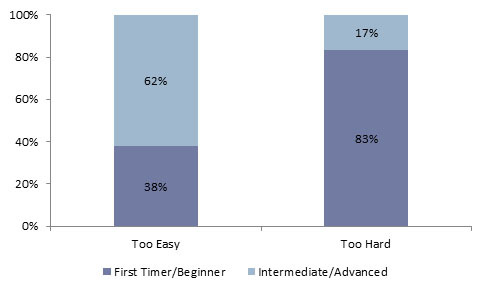 Most of the respondents who found their class to be too hard (83%) identified themselves as first timers or beginners (see Chart 4). 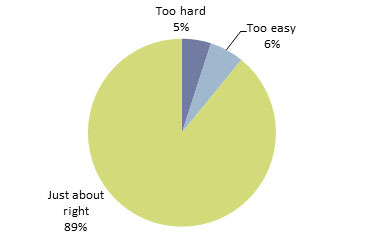 Consistent with this data is that 6 in 10 respondents (62%) who rated the class as too easy possessed an intermediate or advanced level of experience with computers. Results from the survey showed that 7 out of 10 respondents learned about the class from the library (staff, website, email, flyer) (see Chart 5). The remaining 30% learned about the class from a family member or friend, the community (banner, yard sign, flyer), newspaper, radio, or “other” sources (Workforce center, Denver Green Jobs, iCast, etc.). The CSL BTOP grant funded 50 grantees to build or enhance Public Computer Centers (PCCs) in 88 high-need urban and rural communities in Colorado with high poverty rates, ethnic diversity, low broadband penetration, and/or limited access to public computers. The PCCs are located primarily in public libraries, and in a museum, town hall, general store, and other spaces in communities without libraries. In 2011, 54 of the PCCs held launches to publicize their services and to give community members the opportunity to test out and receive training on the new desktop computers, laptops, iPads, and tablets. 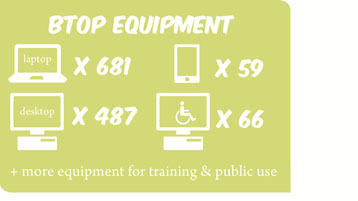 Over the course of the CSL BTOP grant, the planned equipment purchases will total 1,293 computer devices, including 681 laptops, 59 tablets, 487 desktops, 66 ADA compliant stations, and other equipment for training and public use. 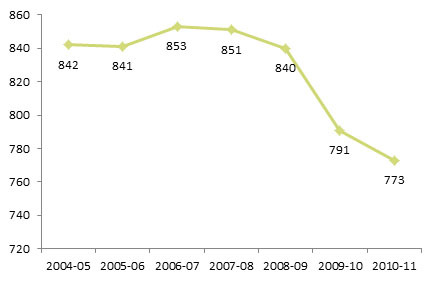 By the end of 2011, more than four-fifths of the PCCs (83%) had purchased and installed their equipment for public use. Each grantee used its own discretion on how to allocate funds based on community needs. For example, the John C. Fremont Library in Florence, which serves the rural areas of Coal Creek, Rockvale, and Williamsburg, offers classes at a senior center and kids clubs via a mobile laptop lab. Likewise, the Lamar Public Library partners with community groups and brings their mobile PCC lab to City of Lamar offices, the Chamber of Commerce, Rotary Club, and to outlying communities in rural areas of Prowers County. Another PCC, the Literacy Center at Delta County, purchased iPads for computer training and in-library checkout. The BTOP team at the Colorado State Library provides library staff with computer training and support to develop, market, and launch their PCCs. The BTOP team developed an extensive “Train the Technology Trainer” program for PCC staff and volunteers. In 2011, three full-time members of CSL’s BTOP team provided 470 hours of instruction (127 classes, workshops, webinars, and boot camps) to 2,883 technology trainers. The BTOP team received progressively higher ratings for these trainings over the course of 3 quarters (March to December 2011). More than 4 out of 5 participants (86%) rated the trainings overall as “excellent” or “above average” in Q2, and these ratings increased to 90% in Q3 and 92% in Q4. About 9 in 10 participants indicated that they would “definitely” or “probably” recommend the trainings to others in Q2 (89%) and Q3 (90%), and 94% did so in Q4. 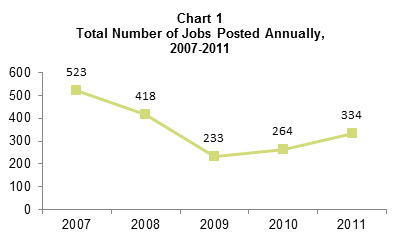 In 2011, staff from 57 PCCs reported offering 1,364 computer training classes to community members (see Chart 1). These classes were attended by 8,625 participants over 2,744 hours of class. 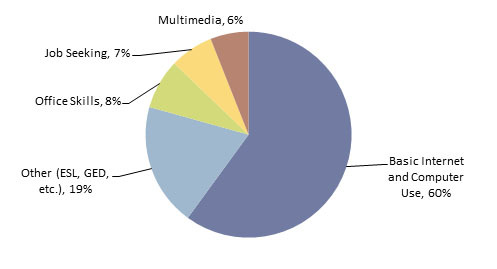 Close to two-thirds of the classes (60%) were about basic internet and computer use (email, internet searching). Classes also covered office skills (Microsoft Office, Quickbooks), job seeking (resume basics, job search strategies), multimedia (HTML, Photoshop), and “other” topics (ESL, GED, genealogy, language learning, grant seeking, benefits access, mobile device usage, etc.). The PCCs also kept track of the use of computers during open access times. In 2011, they reported a total of 1.3 million of these types of uses (see Chart 2). Nine out of ten uses (89%) were unassisted, meaning that residents used the computers on their own. The remaining 11 percent included individual tutoring sessions in which users received assistance from PCC staff or volunteers. 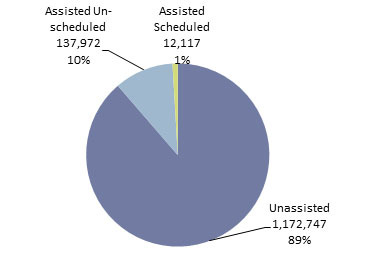 Of the assisted one-on-one sessions, most (92%) were unscheduled. The Colorado Rural Workforce Consortium (CRWC) is comprised of the Colorado Department of Labor and Colorado Workforce Centers and “was formed to meet the collective needs of Colorado’s rural communities relating to workforce vitality.”17 The CRWC consists of 11 workforce regions covering 52 rural counties in Colorado. However, 20 of these counties do not have a workforce center, and the consortium recognized that it needed to devise alternate solutions for providing services to them.18 With 83 public libraries located in the CRWC regions (38 of which are BTOP libraries), libraries were perfectly positioned to team up with the CRWC to help create and implement the Virtual Workforce Center at the Library. LibraryJobline.org, an online resource maintained by the Library Research Service (LRS) at the Colorado State Library, lists job postings from employers in Colorado and beyond.23 Library Jobline dates back to 2007, offering 5 years’ worth of statistics about Colorado’s library job climate. 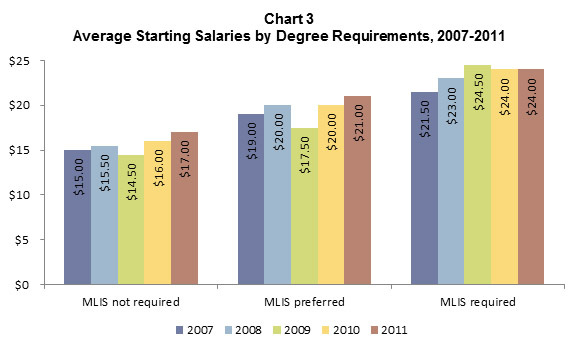 In 2010, the median annual wage for a librarian, according to BLS,24was $54,500 annually, or an hourly rate of $26.50. Whereas data from the 2010 ALA-APA Salary Survey25 (the most recent year available) shows an average starting salary of $48,317 annually, or $23.23 per hour. For recent LIS graduates—notably not all librarians—Library Journal’s “Placements & Salaries Survey 2011”26 reports an average starting salary of $42,566, or $20.46 per hour. Although these data points are valuable in evaluating current and potential salaries for librarian positions, caution should be exercised in comparing them to each other or to Library Jobline data, as they represent different data sets and geographic areas. As part of the Common Core of Data (CCD) program, the National Center for Education Statistics (NCES) releases a report each year on public elementary and secondary schools in the U.S. that includes staffing and student enrollment numbers.27 In 2004, these reports began providing the number of full-time-equivalent (FTE) public school librarians nationwide and for each state. 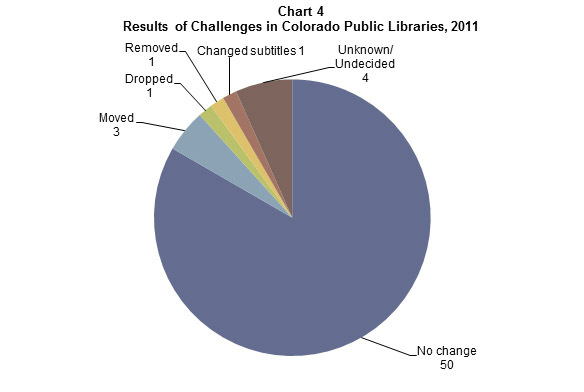 According to the 2010 PLAR,28 approximately 59 percent of Colorado’s public library jurisdictions employ at least 1 person with an ALA-MLS degree.29 Of the 67 libraries that reported employing an ALA-MLS librarian, 4 reported having less than 1 full-time ALA-MLS position. 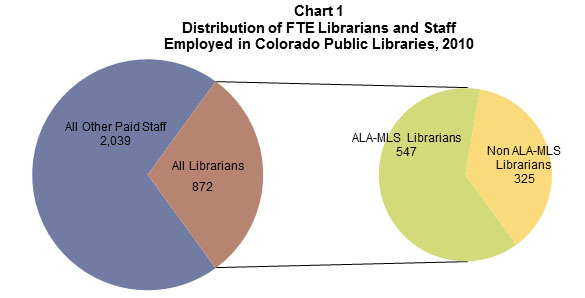 As measured in full-time equivalents (FTEs), more than 6 out of 10 librarian positions in Colorado’s public libraries are staffed by ALA-MLS librarians (63%), and nearly 1 in 5 of all staff positions (19%) (see Chart 1).30 Looking back over time, these figures have remained relatively stable; on average, since 2005, ALA-MLS-certified librarians represented 63 percent of FTE librarians working in public libraries, and just under 19 percent of the public library workforce in general. 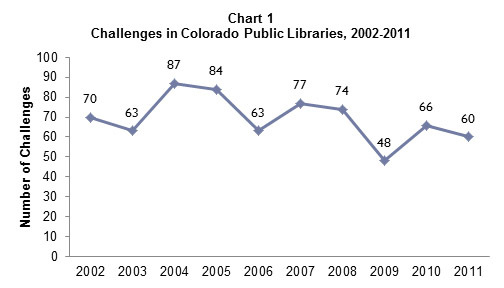 Thus, it seems that external forces, such as the recession, have had little bearing on the proportion of ALA-MLS librarians versus non ALA-MLS librarians working in Colorado’s public libraries. However, the data does not shed light on the issue of part-time versus full-time positions and their relative rise or fall. 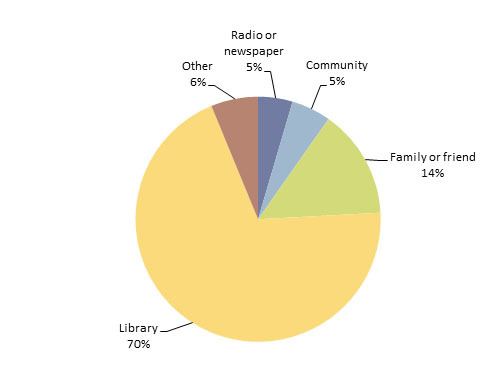 The 2009 PLS data published by IMLS reported that 4,464 of 9,225 U.S. public libraries had ALA-MLS librarians.31 Thus, less than half of all public libraries in the United States employ at least 1 ALA-MLS librarian (48%). 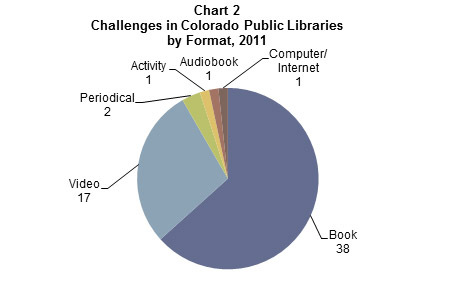 Colorado bests this average, but ranks only 24th nationally, falling behind other states in which greater percentages of public libraries employ ALA-MLS librarians. 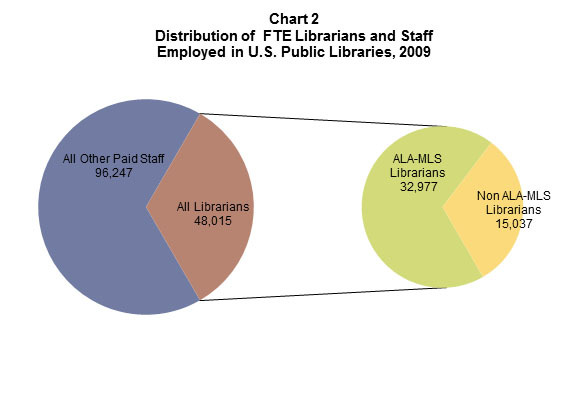 Also according to the PLS data, U.S. public libraries employed more than 144,261 FTE staff, 48,015 of whom were classified as librarians (33%) and 96,247 as other paid staff (67%) (see Chart 2).32 Nearly 7 out of 10 librarians had an ALA-MLS degree (69%) and approximately 1 in 5 of all staff had these credentials (23%).